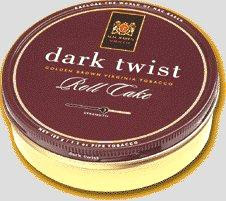 The following is a review I did of Mac Baren's Dark Twist a roll cake on 02/21/2006. A full roll cake tobacco for special moments. Round in taste and quite characteristic. The specially spiced, dark Cavendish ensures its pleasant taste and harmoniously matches the choice Virginia tobacco. Dark Twist indeed. This has got to be the most wicked looking weed that is legal; bares some similarities to another type of plant. This one is fun to rub and look at in my canning jar. This is a decent smoke, but are better VA out there to be sure. All in all I keep it always on hand as my fun smoke and visual seduction effects it has on me. Everyone who likes to get in there and play with their tobacco must try Dark Twist at least once. Overall, a round tasting, good sight seeing, good time.